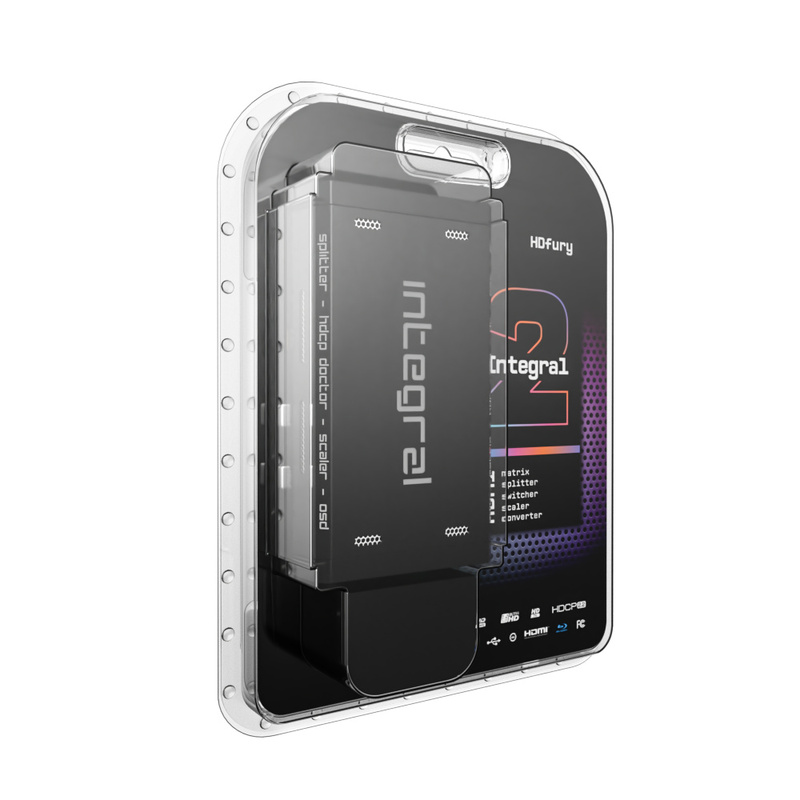 Integral2 will replace: Integral, AVR-Key and Linker once they sold out. It is similar to Vertex without OLED screen. Now shipping every day! 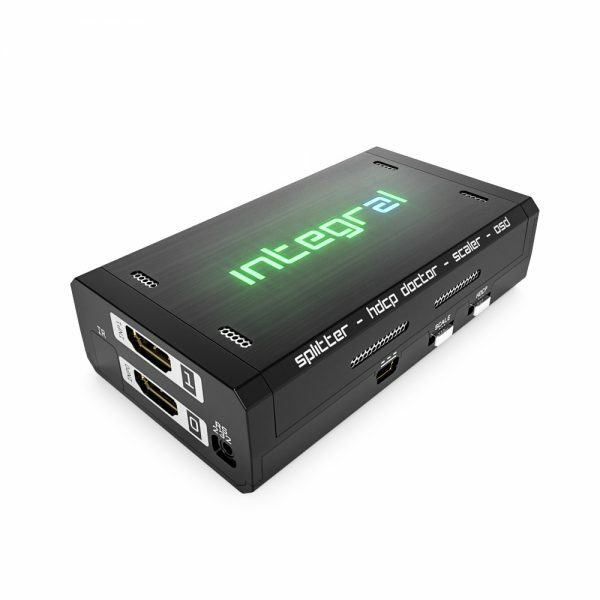 Integral2 allows any source (Blu-ray, UHD Blu-ray, media players, satellite receiver, game consoles, PCs, etc.) to be shown on any of the connected displays and any sources HDMI audio to be played on any AVR. HDfury Integral 2 is a 4K60 4:4:4 600MHz 18Gbps HDMI2.0b Level A smart converter for interoperability between legacy equipment, for integrators, content creators, calibrators, streamers, digital entertainment centers, UHDTV retail, show sites, data centers, schools, conference or home cinema. 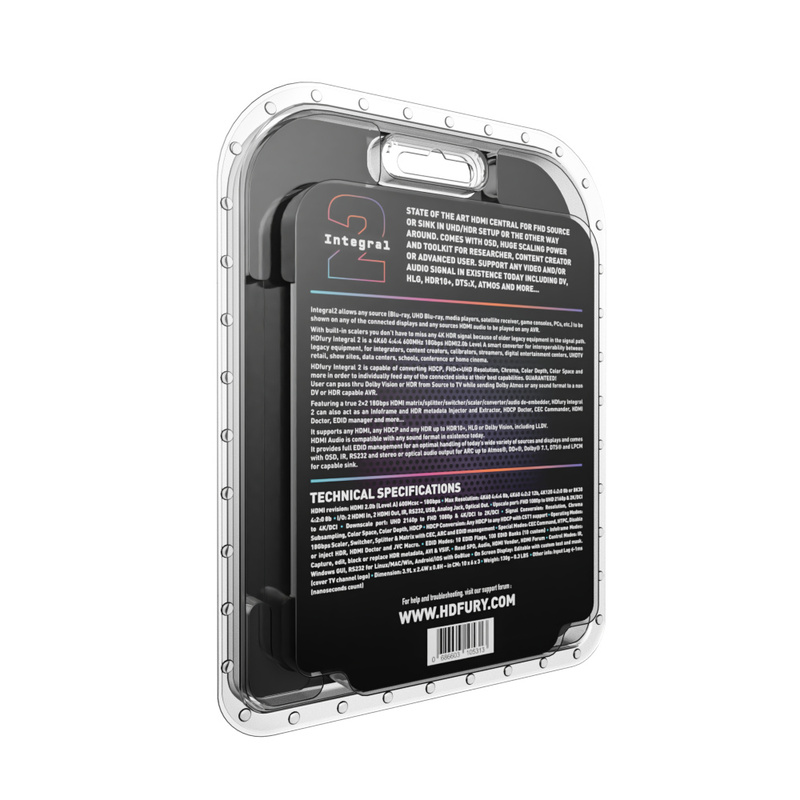 HDfury Integral 2 is capable of converting HDCP, FHD<>UHD Resolution, Chroma, Color Depth, Color Space and more in order to individually feed any of the connected sinks at their best capabilities. GUARANTEED! User can pass thru Dolby Vision or HDR from Source to TV while sending Dolby Atmos or any sound format to a non DV or HDR capable AVR. It supports any HDMI, any HDCP and any HDR up to HDR10+, HLG or Dolby Vision, including LLDV. 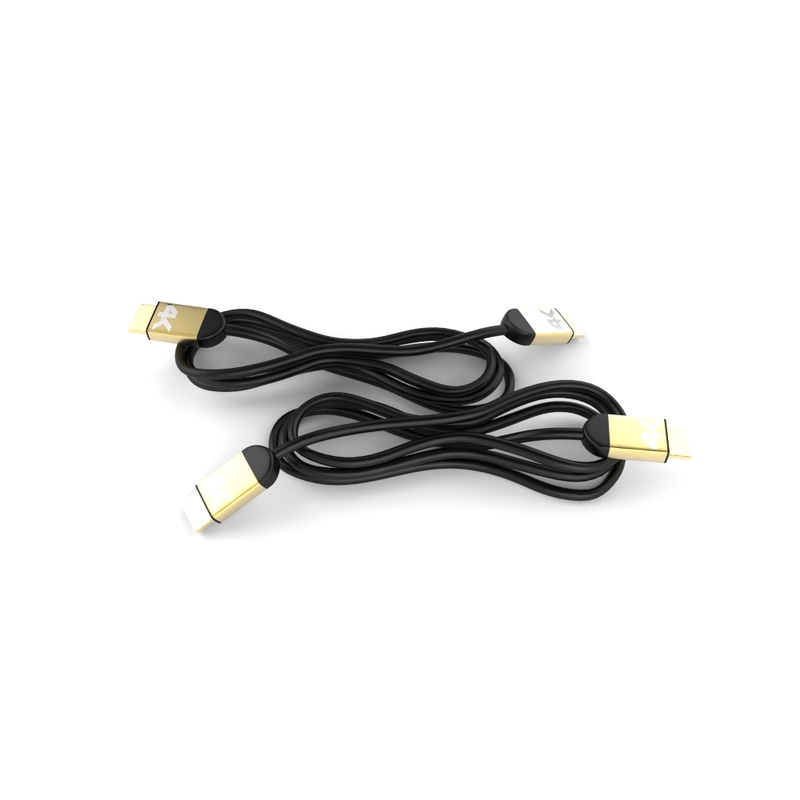 HDMI Audio is compatible with any sound format in existence today. It provides full EDID management for an optimal handling of today’s wide variety of sources and displays and comes with OSD, IR, RS232 and stereo or optical audio output for ARC up to Atmos®, DD+®, Dolby® 7.1, DTS® and LPCM for capable sink. If you ever saw the following statement: “this TV does not support HDCP 2.2. Make sure you have HDCP 2.2 capable TV” or a similar HDCP error message, make sure you never see it again with HDfury Integral 2! 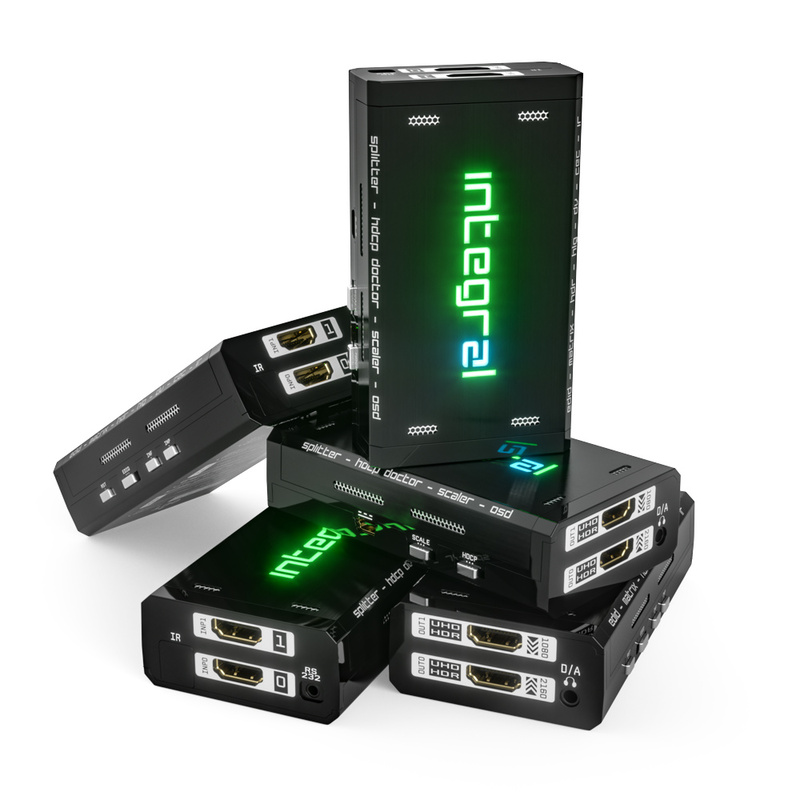 Integral2 supports any HDMI, HDCP and HDR sources or sink and operate in-between to ensure all your equipment work at their best capabilities. Think it’s complicated? Integral2 can suit any user needs with ease. 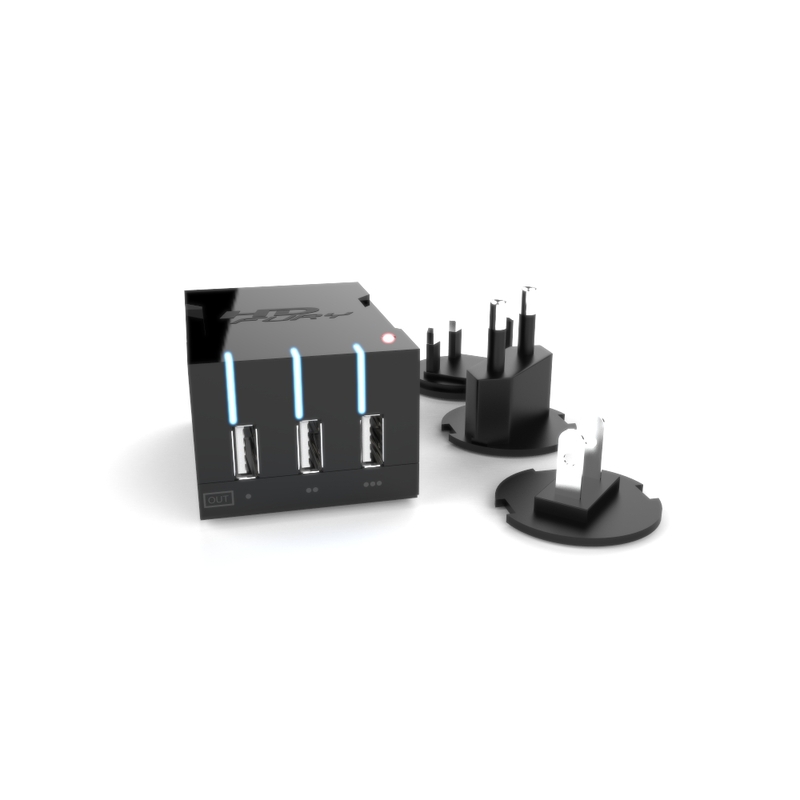 Simply connect sources and sink devices in the right port and add power, Integral2 does the rest. 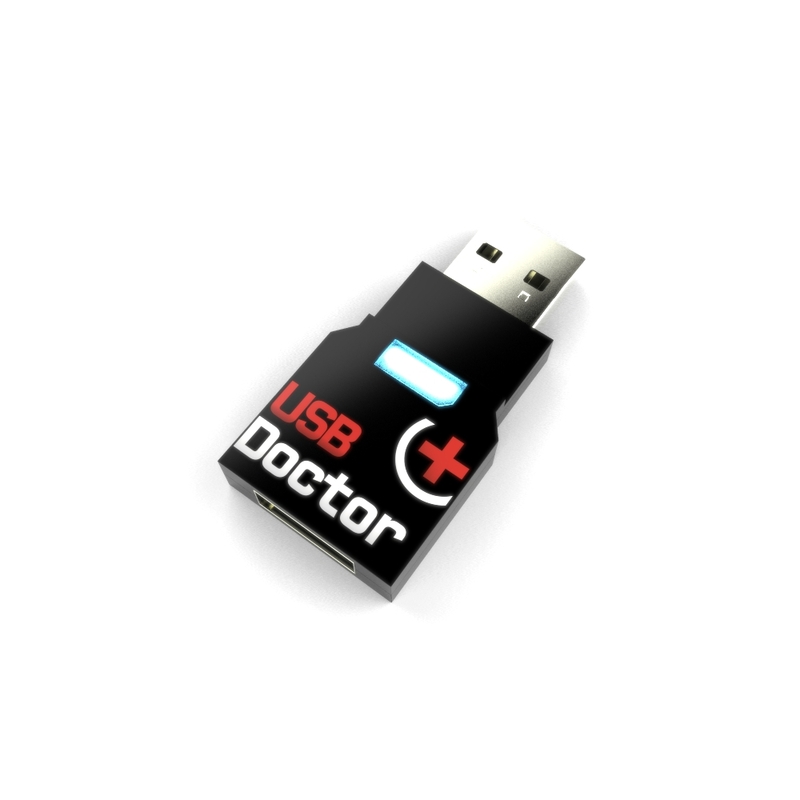 Whether it is on OSD, Windows GUI or via Android/iOS APP with the optional GoBlue, your setup info is always available. Any EDID related issues, HTPC issues or HDMI/HDCP handshake, compatibility or revision issues can be solved with Integral2. 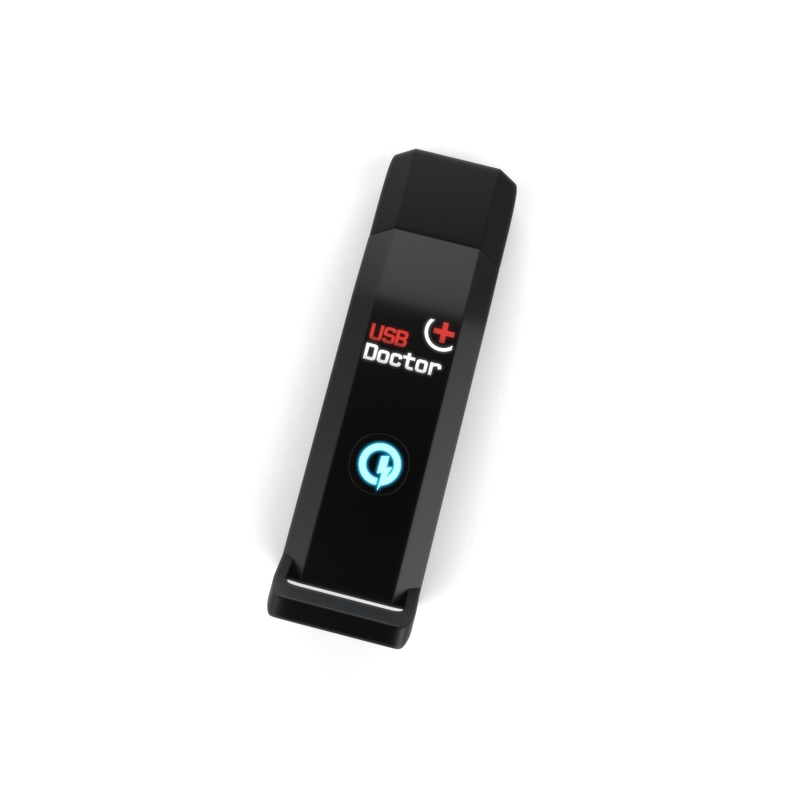 Control Integral2 using your tablet or smartphone with the optional GoBlue Bluetooth and IR dongle. Share your config with the community, display any text on OSD, remove visually annoying or lamp consuming artifacts like TV channel or age restriction logo and more. 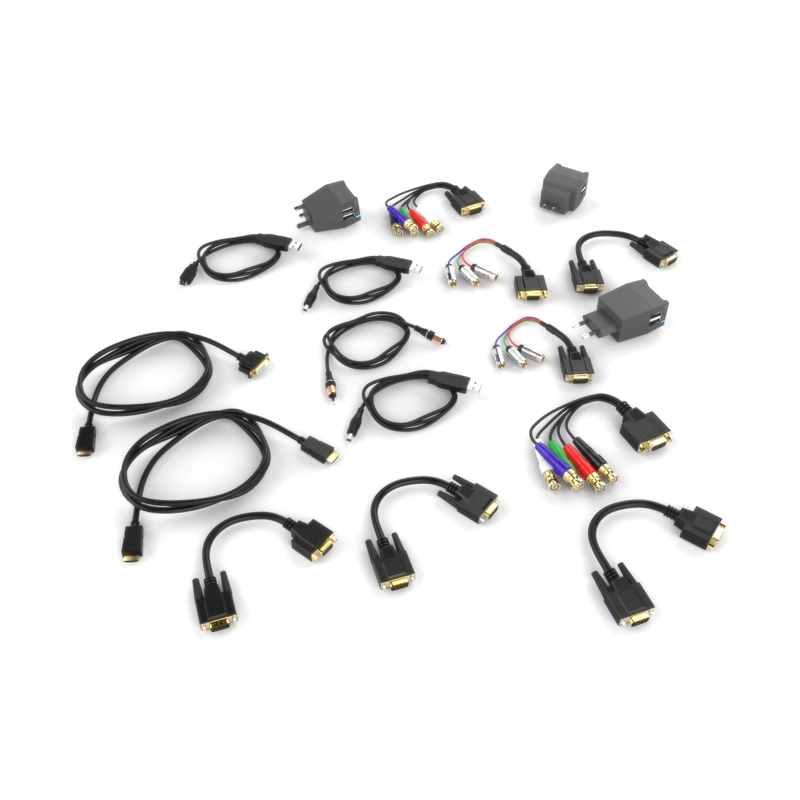 Connect any FHD sink in any UHD setup, play 4K HDR on main stream, and feed your AVR or older display with a 1080p stream. For HDR to SDR, see here. 1 input replicated to 2 outputs, each individual output can be used to upscale or downscale based on your setup needs. Integral2 can process two 4K HDR signals up to 18Gbps simultaneously and apply scaling individually per channel. Access the most advanced Windows GUI we ever created, control your Integral2 unit with ease and style through hundreds of options. Public API/DLL access and extensive control to extract, edit and inject HDR metadata, AVI and VSIF Infoframe. Read SPD, Audio, Vendor Specific and more.